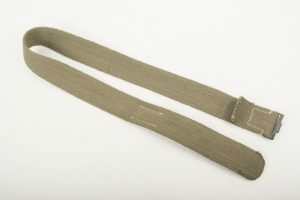 Exceptional early green Afrikakorps equipment belt in a large size 115. Fantastic piece to match with a early green tabbed buckle. 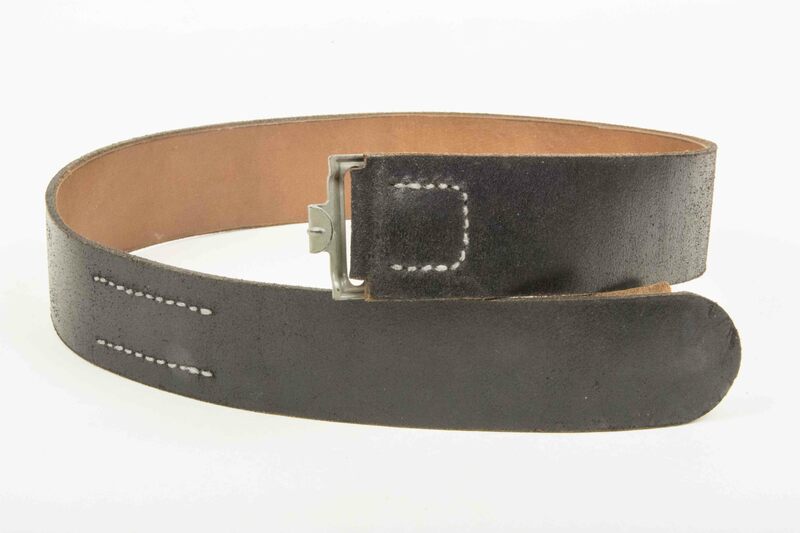 A nice late war grey equipment belt marked RBNR inside the leather tongue. Hard to upgrade piece in a good mannequin size! A nice early pattern tropical belt with woven, not stitched adjustment holes in nice used condition. Hard to find this early pattern for Heer and Luftwaffe troops! Steel Heer belt buckle marked H.A. 41 indicating production by H. Arld, Nuernberg. The buckle still retains up to 99% of its original green paint and would be very hard to upgrade! 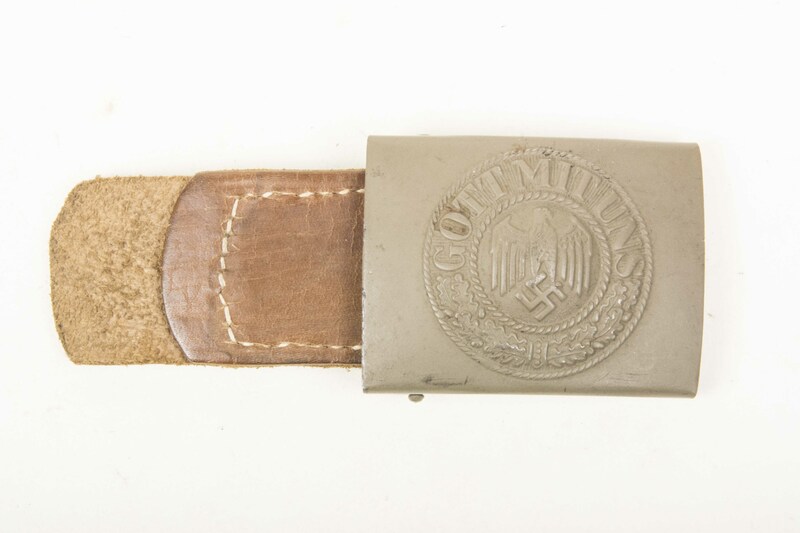 Mint steel Heer belt buckle with originally sewn tab. Nicely marked C.W.Motz. 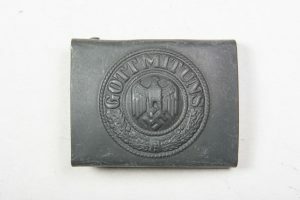 & Co. Brandenburg a. H. 1941. The buckle retains 99% of its original factory paint. If you just want one Heer belt buckle this is it! Rare 1942 dated steel Heer belt buckle with originally sewn tab. The buckle is in near mint condition complete with most of its original paint. 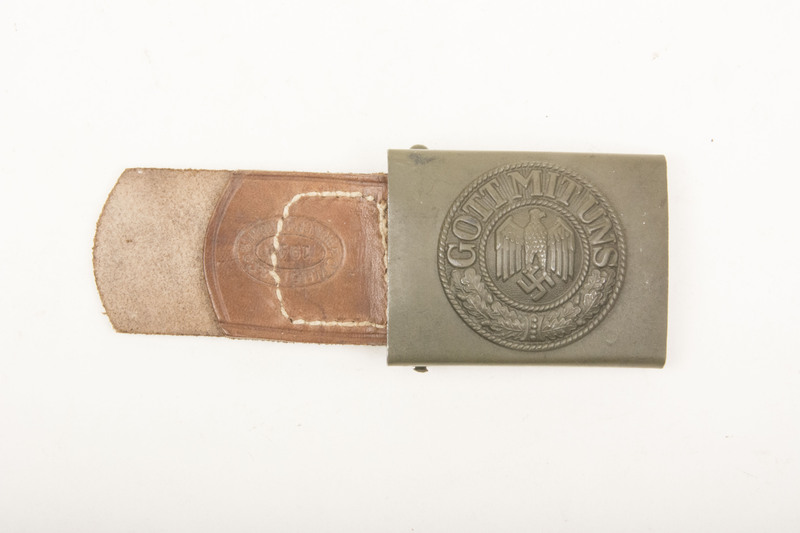 A very nice late war blue belt buckle (Einheitskoppelschloss) in mint condition. The buckle has a set of belt prongs indicating production by Assmann & Söhne, Lüdenscheid. The belt buckle has a typical brown painted set of prongs and still retains 100% of it’s original factory paint! A very nice Heer belt buckle that would be hard to upgrade! 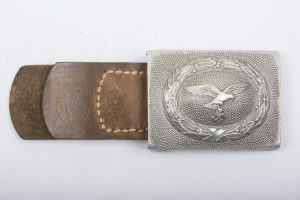 A very nice example of a tropical Heer belt buckle by Gustav Brehmer as intended for wear with members of the Afrikakorps. Marked and dated under the prongs GB 40 surely the earliest tropical belt buckle I have seen! 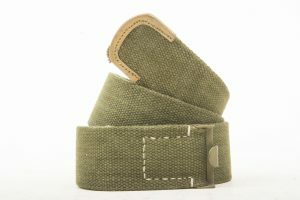 A nice and minty Dutch made equipment belt made by J. De Valk Amsterdam. The belt is roughly a size 100 and would nicely fit most mannequins. Foreign made uniforms and equipment are highly sought after, especially Dutch made items! 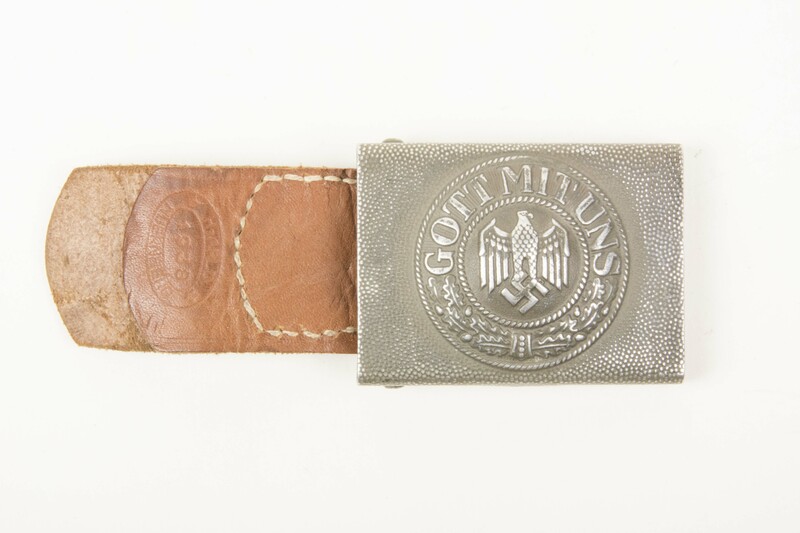 Nice aluminum Heer belt buckle marked G. Brehmer Markneukirchen 1938 in good worn condition. 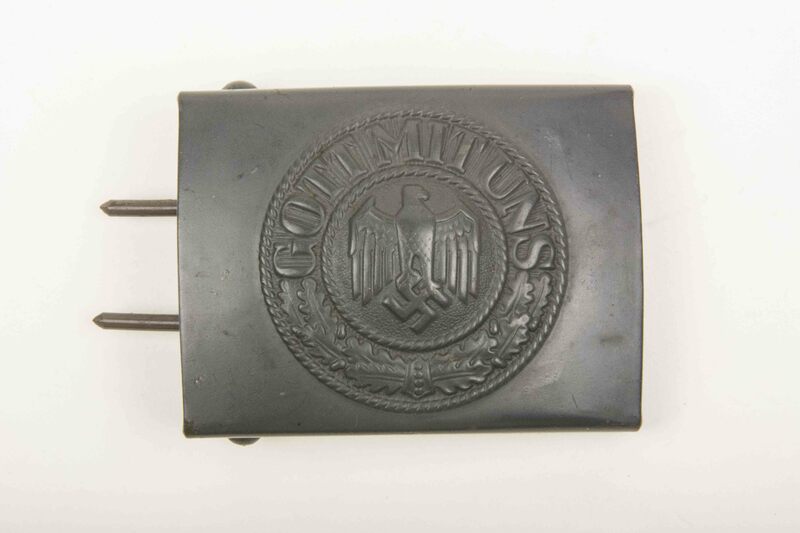 A very nice late war blue belt buckle (Einheitskoppelschloss) in mint condition. Nicely marked JFS indicating production by Josef Feix & Söhne, Gablonz an der Neiße. The belt buckle has a typical brown painted set of prongs and still retains 100% of it’s original factory paint! A very nice Heer belt buckle that would be hard to upgrade! 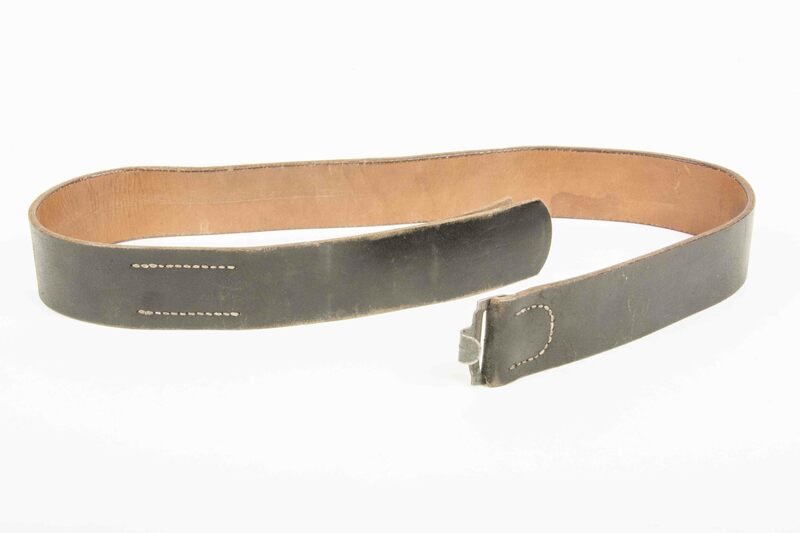 A nice supple leather equipment belt marked Jelinek 1944. 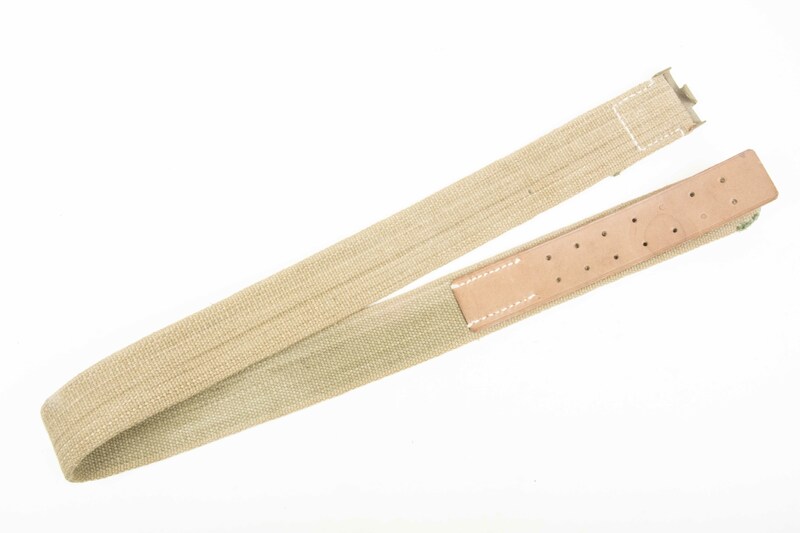 The size of the belt is 85 cm. A nice and typical equipment belt. A very nice original aluminum Heer buckle by H. Arld Nuernberg. The buckle still retains most of its factory green paint which is a rare attribute for these aluminum belt buckles. The buckle is easily graded near mint! A rare buckle in very good condition! 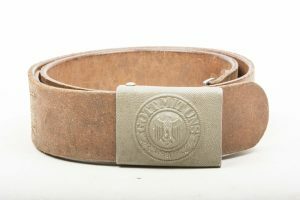 A perfect mint late war belt with a late blue buckle marked N. & H. L. indicating production by Noelle & Hueck, Ludenscheid. The belt is nicely RBNR marked and size 90. The belt and buckle are both in amazing mint condition and would be impossible to upgrade. A mint blue Heer buckle by Bruder Schneider in the original factory wrapping. 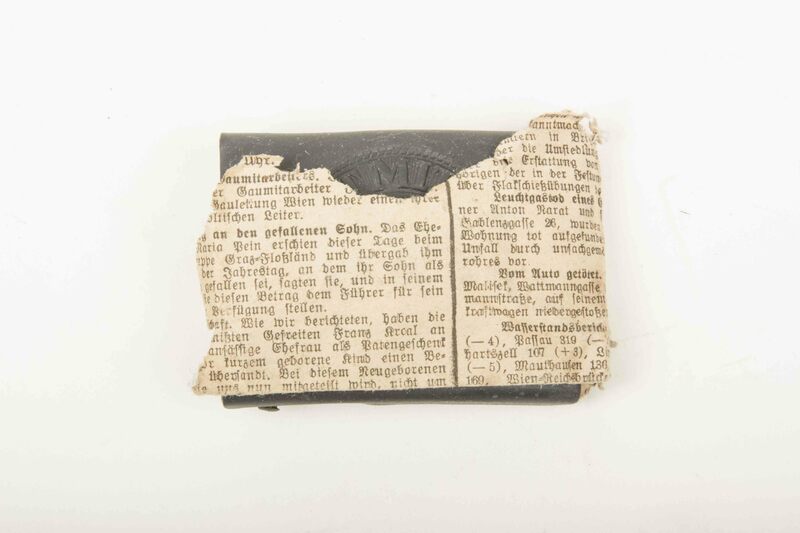 These buckles where wrapped in used newspaper against scratching. First time I see a mint buckle still in its original factory wrapping! 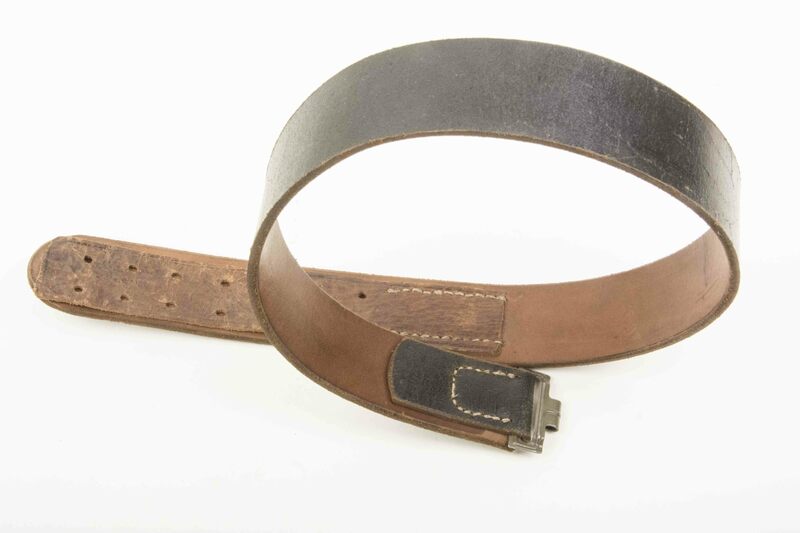 A very nice and supple leather equipment belt marked cqr42 in size 85. The marking cqr indicates production by Lederwerk Sedina Joachim Schell, Finkewalde Bez. Stettin. 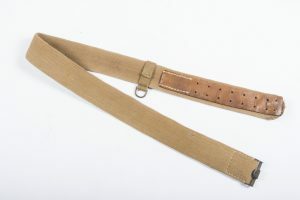 A very nice late war equipment belt marked RBNR and size 85. 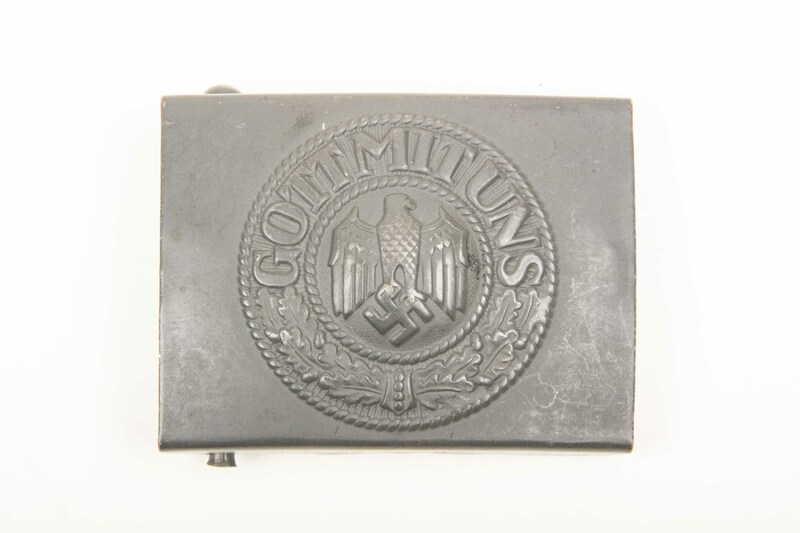 A very nice late war blue belt buckle or Einheitskoppelschloss in near mint condition. The belt buckle still retains 100% of it’s original factory paint! A very nice Heer belt buckle that would be hard to upgrade! 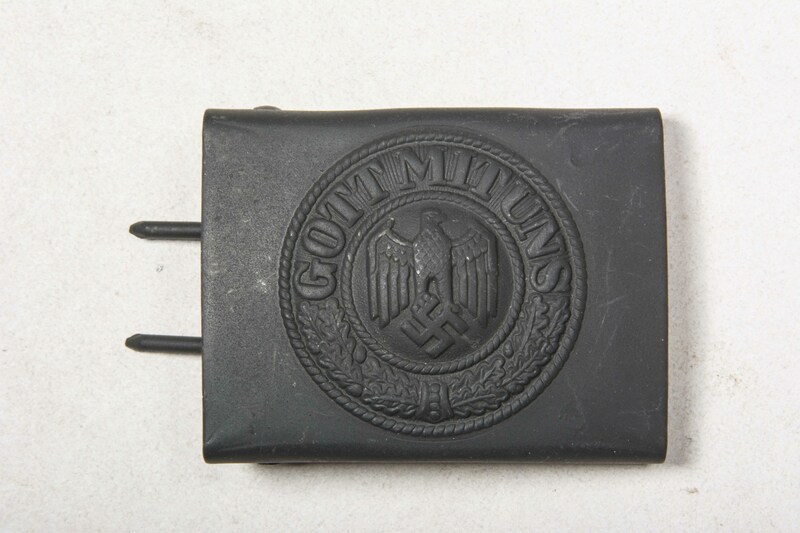 A very nice mid war belt buckle marked N&H 1942 indicating production by Nolle & Hueck, Lüdenscheid. 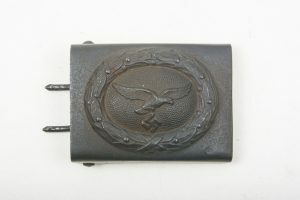 The buckle is finished in Blaugrau paint thats also known as Einheitsfarbe. The buckle is the earliest example of a blue painted Heer buckle that I’ve found. 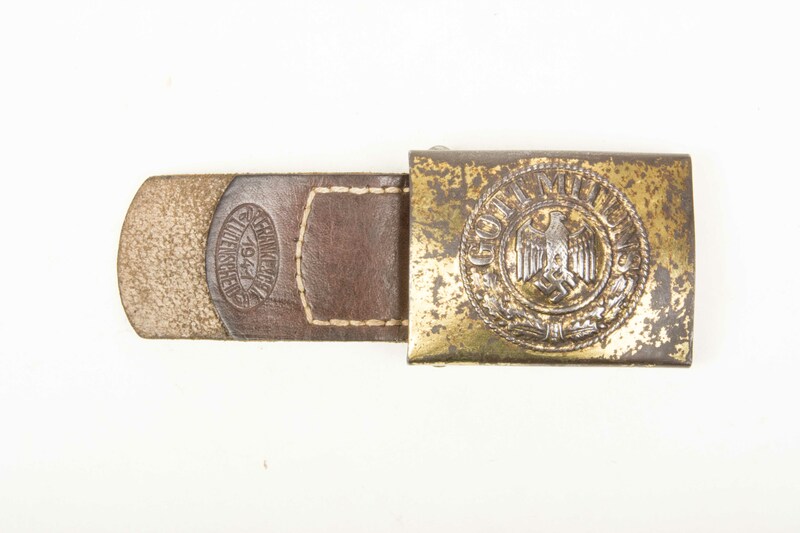 These early blue buckles are referred to as being made and issued to the Kriegsmarine. 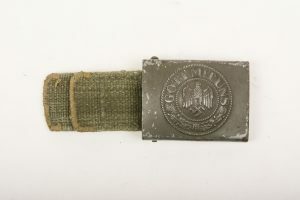 Later in the war the blue Heer buckles started being issued to other branches and officially labeled Einheitskoppelschloss. Hard to find a early blue buckle! 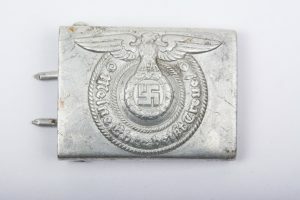 A nice original Steel tabbed Kriegsmarine belt buckle marked Dr. Franke & Co 1941. 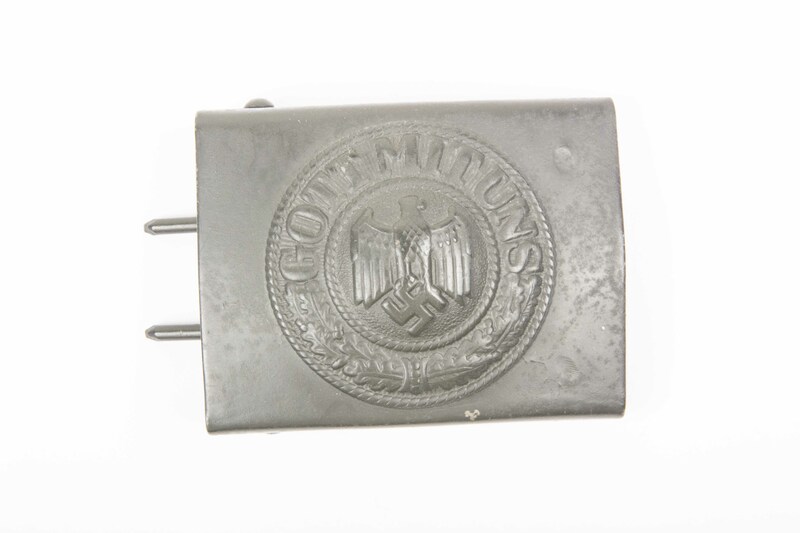 Tabbed steel Kriegsmarine belt buckles are hard to find and this one is in good, used condition! Hard to upgrade mint condition web equipment belt. Never had a buckle installed! 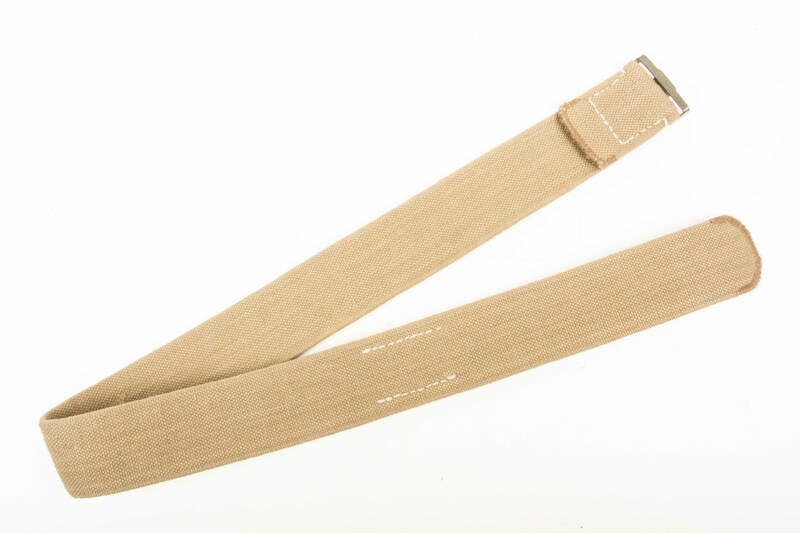 This webbing belt is a nice large size 100cm. Nice original webbing equipment belt marked Jobra 1943. Sized 85 cm. 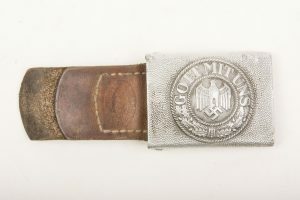 A top mint late war Heer belt buckle in blue color or Einheitskoppelschloss by RODO. A stunning belt and buckle set which are in mint condition. The belt is nicely marked Böttcher & Renner, Nürnberg-O 1938. 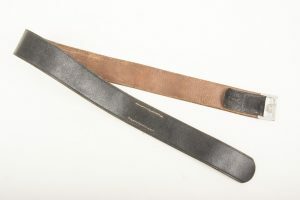 The belt is supple and still in its natural brown colour and has not been polished. 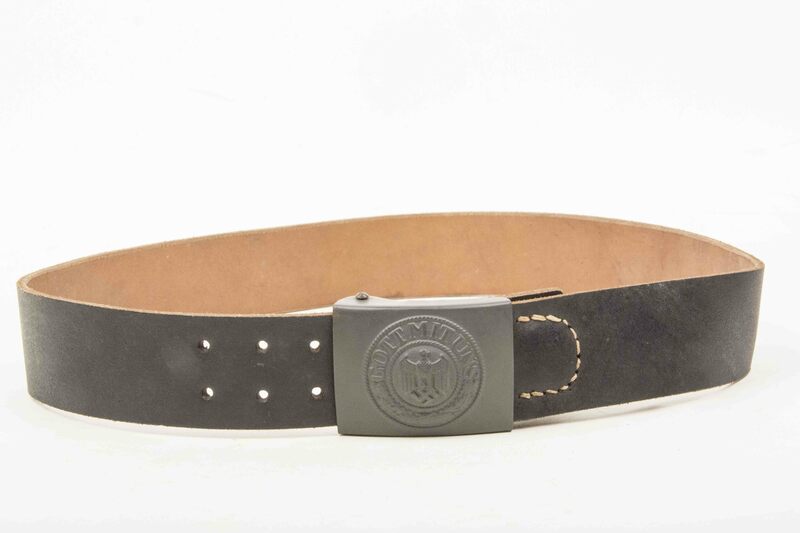 The belt is a nice large size 95 cm. 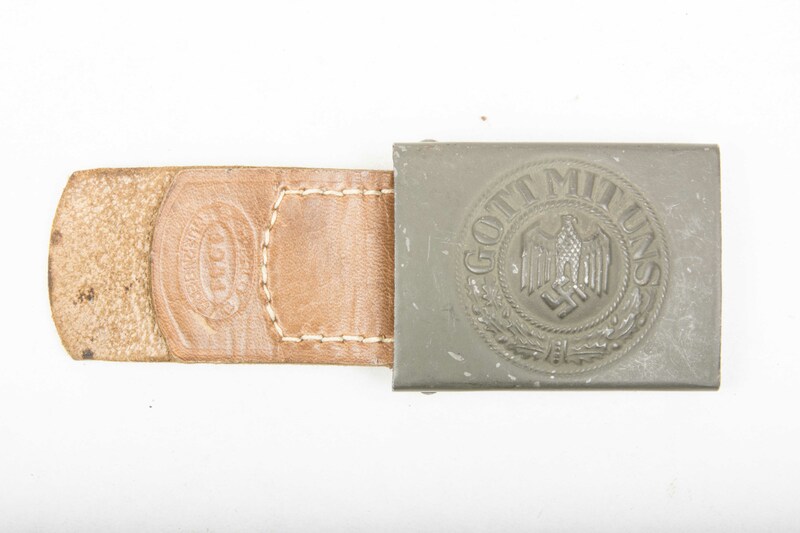 The buckle still retains up to 95% of its original green paint and is not visually maker marked but is made by Dransfeld. 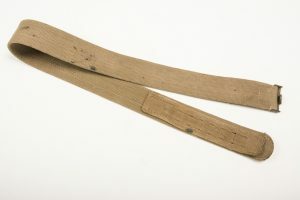 These early undyed belts with matching buckles with original paint are very scarce and as such I would grade this belt very hard to upgrade. If you are looking for a pre 1940 buckle and belt set this it it! 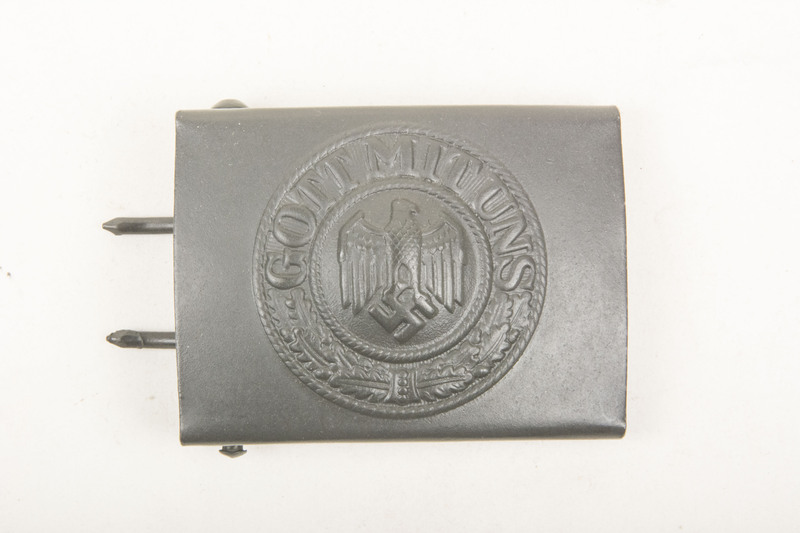 A very nice late war blue belt buckle (Einheitskoppelschloss) in near mint condition. The belt buckle has via phosphate treated set of prongs and still retains 100% of it’s original factory paint! A very nice Heer belt buckle that would be hard to upgrade!